CIA Director Gina Haspel addresses the audience as part of the McConnell Center Distinguished Speaker Series at the University of Louisville, Sept. 24, 2018, in Louisville, Kentucky. The United States' premier spy agency is looking to expand its presence around the globe in order to eliminate so-called "intelligence gaps" and take on the growing threat from major powers like Russia and China. CIA Director Gina Haspel on Monday called the shift from counterterrorism back to more traditional espionage against nation-states "a strategic priority," saying the need to get better intelligence on current and potential U.S. rivals is among "the hardest issues" facing the spy agency. "We are sharpening our focus on nation-state adversaries," Haspel told an audience at her alma mater, the University of Louisville, in her first public appearance since being sworn in as CIA director this past May. Haspel also said she is intent on "increasing the number of officers stationed overseas." "Having a larger foreign footprint allows for a robust posture," she said. She also said the spy agency "is working more closely than ever with our allies across the world." Haspel's comments reflect priorities laid out in the broader U.S. National Security Strategy late last year, which calls for countering moves by various adversaries to shift the global balance of power in ways that have been unfavorable to the United States. 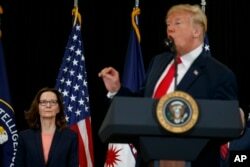 Incoming Central Intelligence Agency director Gina Haspel listens as President Donald Trump speaks during a swearing-in ceremony at CIA Headquarters, May 21, 2018, in Langley, Virginia. The CIA director voiced particular concerns about China, which she said was "working to diminish U.S. influence in order to advance their own goals." "We do monitor very closely what appears to be an effort to expand their influence beyond their own region, in places like Africa, Latin America, the Pacific islands, South Asia," she said. "We are concerned by some of the tactics they use, offering poor countries, investments, and loans that perhaps those countries are not going to be able to repay," Haspel said. "We want those countries to be aware of their own sovereignty and how foreign investment in their infrastructure and their national security infrastructure can ultimately compromise their sovereignty." "It should come as no surprise that one of my top priorities since becoming director has been to champion diversity and inclusion," she said. "Our global mission at CIA demands we recruit and retain America's best and brightest, regardless of gender, race or cultural background." Drugs: "CIA is going to invest more heavily in our counternarcotics efforts abroad," Haspel said, calling the opioid epidemic a threat "that has killed far more Americans than any terrorist group ever has." Secretary of Veterans Affairs Robert Wilkie, left, and CIA Director Gina Haspel, center, attend a cabinet meeting in the Cabinet Room of the White House, Aug. 16, 2018, in Washington. Iran: Haspel called the amount of money Tehran continues to spend on propping up the government on Syrian President Bashar al-Assad, to expand its influence in Baghdad and to back the Houthis in Yemen, "surprising" given the country's economic struggles. "We are we are watching very closely, Iran's malign activity in the region. And we'd like to push back against that activity, so those countries can carve their own course," she added. Transparency: "Nothing is more important to those of us at CIA than our obligation to earn the trust of our fellow citizens," Haspel said. "There's not another major intelligence agency in the world subject to oversight authority as comprehensive as our own but that's as it should be." Morale: "CIA is a very resilient workforce and we tend to be extremely mission-focused," Haspel said. "We tend not to pay attention to the political fray in the capital."